Richer by Royal Appointment | What Hi-Fi? The company, which was founded in 1978 with its first shop at London Bridge, has been awarded a Royal Warrant of Appointment to HRH The Prince of Wales as a supplier of consumer electronics products. The Royal Warrant is effective from the beginning of this year. 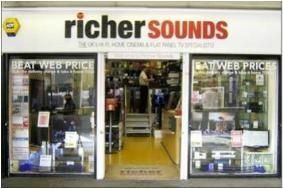 Richer Sounds now has 52 shops, ten of which are in London, and its original shop consistently appears in the Guinness Book of Records for the highest sales per square foot of any retail outlet in the world.